Derry defender Jack Doyle scored the winner against Waterford. BLACKBURN Rovers loanee, Jack Doyle proved the hero at Brandywell Stadium as his second half header saw off high flying Waterford and ensured a SIXTH successive victory for the in-form Candy Stripes. The win moved the Candy Stripes into fourth place above Shamrock Rovers going into Monday night's home clash against Bohemians as Kenny Shiels' side continue to gather momentum. Waterford were depleted but dominated the ball in the first half and came so close to taking the lead on 24 minutes when Izzy Akinade's shot was cleared off the line by Gavin Peers. It was a total transformation from the home side in the second half and they deservedly took the lead on 53 minutes when Doyle nipped in at the back post and headed downwards into the net to keep City's winning run going while the Blues slumped to a third loss of the campaign. It was certainly a game of two halves and Shiels paid tribute to the incredible home support for driving his players on to a significant victory. "We were definitely the better team in the second half and they have really good players," he said. "I'm delighted for the supporters. They got behind us. The way we started the second half, we started doing what we're good at and passing the ball and it lifted the crowd. We had a couple of early half chances and the crowd were unbelievable in the second half. They went in tandem with us. "The volume and intensity of the crowd gave us a great lift and it must've been great for neutral people to see that,. I genuinely felt the crowd played a significant part in the win." Shiels had opted for the same team which earned a 2-0 win at Sligo last weekend as the influential Nicky Low and Ronan Curtis passed late fitness tests. However, Alan Reynolds, whose touchline ban begins on Monday night, made four changes to the side which defeated Cork in the Munster derby with Stanley Aborah and Bastien Hery serving suspensions for their parts in the melee at the RSC. There was no place in the starting XI for Kenny Browne or Courtney Duffus with Sander Puri, Faysel Kasmi, Rory Feely and John Kavanagh all handed starts. Waterford controlled the game during the opening stages, Derry content on sitting back, soaking up the pressure in the hope of hitting on the counter. The Blues were dominant in the air and from Paul Keegan's corner on six minutes, Rory Feely headed into the hands of Gerard Doherty. The visitors got off the hook on 10 minutes when goalkeeper, Lawrence Vigouroux took a heavy touch from a back pass but Rory Patterson didn't react quickly enough to capitalise and Waterford cleared the danger. At the other end a loose Patterson pass made its way to Sander Puri on the left wing and he fired a powerful strike across goal and wide of the far post. Derry's first attempt arrived on 20 minutes when Rory Hale hit a speculative volley high over the bar from the edge of the penalty area. Izzy Akinade was causing problems for the City defence and he had a glorious chance to break the deadlock on 24 minutes. Gavan Holohan spread the ball wide on the right to Puri who found Akinade with a terrific ball but Doherty got enough on the striker's shot to allow Gavin Peers time to clear off the line. Seven minutes before the break, Aaron McEneff laid the ball back to Rory Hale and his 20 yard curling effort was parried clear by a terrific save from Vigouroux. Waterford had an excellent chance to open the scoring on 40 minutes when a long ball over the top found Akinade as Eoin Toal slipped, but just as the striker bore down on goal the City defender managed to stick his foot out and deflect the shot behind for a corner. Tempers flared after a tackle on Ronan Hale in the middle of the park with referee, Neil Doyle flashing yellow cards to Rory Hale and David Webster following a lengthy stoppage. Derry made an encouraging start to second half and from a Ronan Hale cross from the right flank as Patterson got in front of his marker but his flicked header nestled onto the roof of the net. And the early pressure paid off on 53 minutes as City took the lead. Ronan Hale's inswinging cross towards the back post was met by the head of Doyle and his downward header crept into the net at the near post. Four minutes later Ronan Curtis almost doubled the lead as he brushed off the challenge of three Waterford defenders before his strike was tipped over the bar by ex-Liverpool keeper, Vigouoroux. Ronan Hale skipped past substitute, John Martin inside the Waterford penalty area and crossed towards the six yard area where the ball broke to McEneff whose close range shot was somehow saved by the outstretched leg of Vigouroux. It really should've been 2-0 to Derry but they weren't disheartened. The waves of attacks continued and goalscorer, Doyle found space inside the Waterford area and tried to find the far corner but his shot deflected wide for a corner with four minutes to go. Curtis then found space in behind the Waterford defence and skimmed the crossbar with a terrific hit in stoppage time before Ronan Hale fired a gilt-edged chance wide at the death. 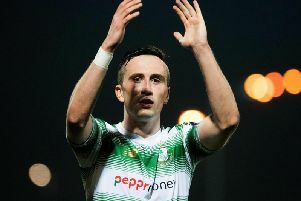 It could easily have been a more flattering victory for the home side who had more left in the tank as Waterford ran out of legs in the latter stages but Shiels was delighted with a second successive clean sheet and a win which sees them rise to fourth. Derry City: G. Doherty, C. McDermott (D. Cole, 57), G. Peers, E. Toal, J. Doyle; Ronan Hale, N. Low, R. Hale, R. Curtis; A. McEneff; R. Patterson: Subs Not Used - E. Grimes, J. McDonagh, J. Cofie, B. Doherty, S. Whiteside, N. Logue. Waterford: L. Vigouroux; J. Kavanagh, R. Feely, D. Webster, D. Barnett (D. Daly, 70); F. Kasmi, P. Keegan, G. Comerford (J. Martin, 70), S. Puri (D. Walsh, 76); G. Holohan; I. Akinade; Subs Not Used: N. Corbet, K. Browne, D. O'Halloran.